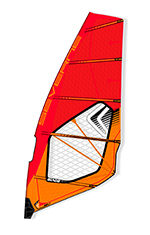 Classed as their ‘control oriented wave’ sail the Blade has been “time tested” by Severne, to provide the “perfect blend of power and control”. Completely re-defined last season with new luff curves, fittings and panel layouts, the refinements for 2018 extend upon this, intending to improve styling and elevate the Blade’s reputation as a choice product. Its dimensions remain largely the same, yet there’s a new high-quality scrim in the foot panels called eM4, included to reduce the Blade’s physical weight further still without compromising durability. With all the usual attentions to detail, (such as seamless head and foot panels, a thermoformed tack fairing with internal mesh pocket and a 90-degree aligned tack pulley for reduced-friction downhauling), it is available in two colour-ways and was tested here on a Severne Blue RDM 400cm mast. With one of the most upright luff curves in the group, the mast is very easy to sheath and the Blade simple to downhaul, the leech falling away moderately along its length. Retaining the slightest rotation in its lower battens, the Blade’s resting profile has shape low down, yet remains relatively flat above the boom, benefiting from the play in the luff panel and sleeve to fill into a deeper, more powerful form as the wind builds. Responding to pumping like a wound spring, it accelerates rapidly and has a noticeably efficient nature, twisting beautifully as if the whole sail is driving you forwards. It is also incredibly light and balanced in the hands, the power coming on through both arms rather than just the backhand. If you’re not used to the sensation it may take a little getting used to, as you tend to almost over-sheet, ready to counteract the extra pull anticipated from an approaching gust. And it’s for this reason that the Blade continues to galvanize its reputation for wave riding each year we try it. Entering a bottom turn with speed, it generates the drive and momentum before seeming to disappear mid-transition, lending the rider the time to pick their moment and manoeuvre at the wave’s section. 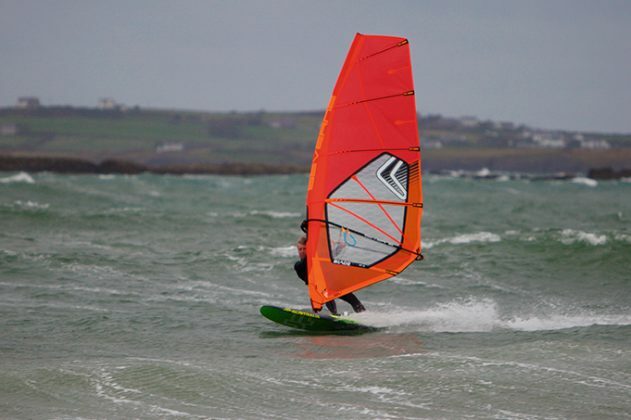 Yes, the Blade can admirably fulfil a coastal blasting / bump-and-jump role – its Dacron luff panel and built in structure helping to smooth over any violent feedback from the terrain underfoot or gusting squalls. Yet, it is physical lightness and neutral handling that the Blade continues to set the standard for each year – something that we can’t help but admire and be excited by whilst using it. Mesmeric handling combined with efficient power over a massive range, the Blade continues to seduce. One of the more expensive sails in the group, but what price do you put on such a polished performance?